In this epic adventure thriller, a family struggles to survive in a post-apocalyptic American landscape: a world of overgrown cities, treacherous militias and heroic freedom fighters, fifteen years after every single piece of technology - computers, planes, cars, phones, even lights - had suddenly blacked out ... forever. Includes All 20 Episodes Plus Over 90 minutes of Special Features! BURBANK, CA (June 6, 2013) - Fans are "powering up" to own one of the most-watched new shows of the 2012-2013 season as Warner Bros. Home Entertainment (WBHE) gets set to release Revolution: The Complete First Season on DVD and Blu-rayTM Combo Pack September 3, 2013. With its first season, Revolution broke out as a hit amongst critics and fans, landing a top spot as TV's #1 new show with Women 18-34 and Men 18-49 and averaging 12.6 MM viewers per week! 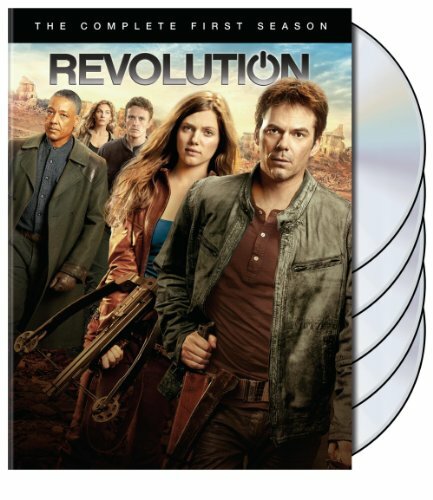 Revolution: The Complete First Season includes all 20 action-packed episodes from Season 1 and is available to own for $59.98/$69.97 SRP. The release includes over 90 min. of bonus content including two featurettes, a gag reel, deleted scenes, and bonus webisodes. The Blu-rayTM Combo Pack contains an additional 30 minutes of bonus features and includes the Blu-ray(TM) and standard DVD editions of the release, plus an UltraVioletTM digital copy of all 20 episodes. In this epic adventure thriller, a family struggles to survive in a post-apocalyptic American landscape: a world of overgrown cities, treacherous militias and heroic freedom fighters, fifteen years after every single piece of technology - computers, planes, cars, phones, even lights - had suddenly blacked out ... forever. A swashbuckling journey of hope and rebirth, Revolution is seen through the eyes of a strong-willed young woman, Charlie Matheson, who has lost members of her family in the blackout's tragic aftermath, but has gained a new family and a new purpose. Together, with a rogue band of survivors - including her secretive mother Rachel and formerly estranged uncle Miles, an ex-marine and militia leader - she sets out to overthrow the dangerous Monroe Militia (led by the volatile Sebastian Monroe), restore the power - and balance of power - and ultimately re-establish the United States of America. Created by Eric Kripke (Supernatural), and executive produced by J.J. Abrams (Lost, Star Trek, Alias), Bryan Burk (Star Trek, Fringe, Lost) and Kripke, Revolution stars Billy Burke (The Twilight Saga), Tracy Spiridakos (Being Human), Giancarlo Esposito (Breaking Bad), Zak Orth (Nurse Jackie), David Lyons (ER), Daniella Alonso (Friday Night Lights), Graham Rogers (Memphis Beat), JD Pardo (The Twlight Saga: Breaking Dawn - Part 2), Tim Guinee (Iron Man 2), and Elizabeth Mitchell (Lost). Revolution is produced by Bonanza Productions in association with Bad Robot Productions, Kripke Enterprises and Warner Bros. Television. "We are thrilled to release Revolution: The Complete First Season on DVD and Blu-ray Combo Pack this fall," said Rosemary Markson, WBHE Senior Vice President, TV and Special Interest Marketing. "As a breakout fan favorite, we cannot wait to share this series with fans, both old and new, to deliver the excitement that has garnered tons of buzz throughout the year."